Private industry leaders, researchers, engineers and other technical experts converged on the Georgia Tech Global Learning Center Oct. 1-2 to exchange ideas on solving the challenges in the renewable bioproducts arena. 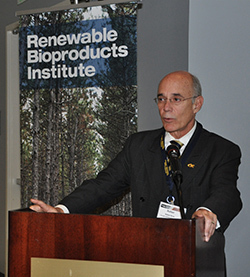 More than 80 individuals attended the event, Renewable Bioproducts: Advances in Lignocellulosic Processes and Products, hosted by the Renewable Bioproducts Institute. Companies such as Coca-Cola, Algenol, Renmatix and Michelin among others joined many representatives from a number of pulp and paper companies to participate in two days of panels and networking. 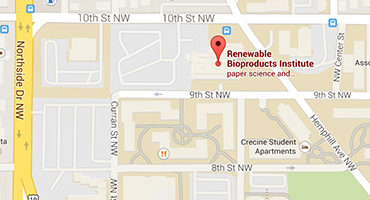 Earlier this year, Georgia Tech announced a broader research mission, additional resources and a new name for the Institute of Paper Science and Technology (IPST), the Renewable Bioproducts Institute. Over the last several years, the Institute’s mission has broadened beyond papermaking to include technologies that produce chemicals, biofuels and new materials from forest raw materials. The expanded scope and new name reflect that emerging reality, and position RBI to engage with broader industry partners to create opportunities for industrial and manufacturing arenas, according to Marsolan. “This event is the first of many that can showcase the economic opportunities that exist through companies’ access to Georgia Tech’s world-class experts in materials science, chemistry and engineering, as well as through access to talented engineering graduates familiar with bioproducts technologies and opportunities,” he observed. 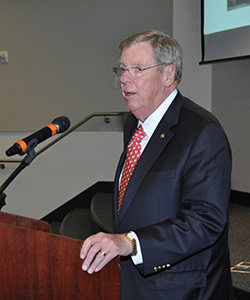 During the two-day session, panels consisted of industry representatives and Georgia Tech leaders. 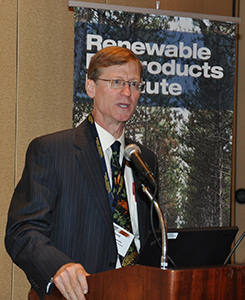 Topics included technology insights and emerging research and opportunities in chemicals and fuels, as well as materials. Experts also shared their insights into multiple areas of cutting-edge research, such as biopolymers, transportation, electronics, biofuels, plastics and specialty products. Georgia Tech Provost Rafael Bras also addressed the group, emphasizing the important role both Georgia Tech and RBI play in the future of industry as it evolves. “It’s a dynamic institute (RBI) that is moving onward. It fits our quality enhancement program, our accreditation process, our economic development and industrial strategy,” Bras said. David Constable, director of the Green Chemistry Institute, closed out the conference, discussing the depleting supply of critical elements and the evolution that must take place in chemistry to meet the needs of a complex market. Marsolan said he looks forward to facilitating more of these roundtable discussions, providing a forum for both industry and academics to share challenges and solutions.